I have been making things from fabric and yarn since I was just a little girl playing while my mum sewed. Now I create dolls and their clothes in my teensy tiny studio in Tasmania surrounded by books, flowers and vintage goodness. 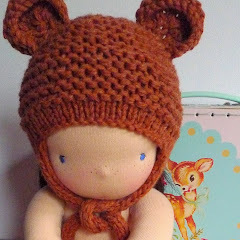 My dolls begin as an idea, a smile, a piece of cotton fabric and a large handful of soft creamy coloured wool fleece. 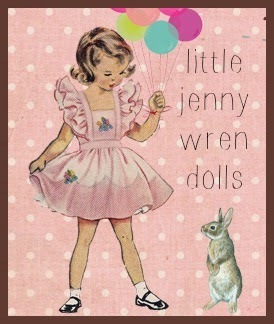 I am surrounded by memories of my own sweet childhood and those of my children, by vintage children's books and vintage dolls, by my garden and flowers and music and life. My studio is in the heart of my home. fuelled by my emotions and dreams. All the knitting and sewing and dreaming I have done in my life, my childhood of reading and doll playing and make believe games in the playhouse at the bottom of the garden or in the bushland around my childhood home, my love of history and sweet old treasures, my own dear children... all these things come together in my work. And it is this love of childhood that people recognise and are drawn to in my dolls, they touch deep places that people have perhaps left behind as they have become grown ups, they remind them of the innocence and beauty of children, they celebrate the spirit of childhood. they are to become a playmate and confidante of a child.